Read more about how Fillers don't belong in chocolate. Vicuña Chocolate embodies this spirit by crafting pure, complex dark chocolate in a quality that is seldom experienced; “food of the gods,” indeed. Vicuña chocolate contains only the ingredients that warm your solar plexus and delight your mouth: ethically sourced cacao and pure, organic cane sugar. That means our chocolate is free of the fillers and artificial ingredients of the big brands—soy lecithin, cacao butter, and added flavors. Sorry, Big Chocolate brands! 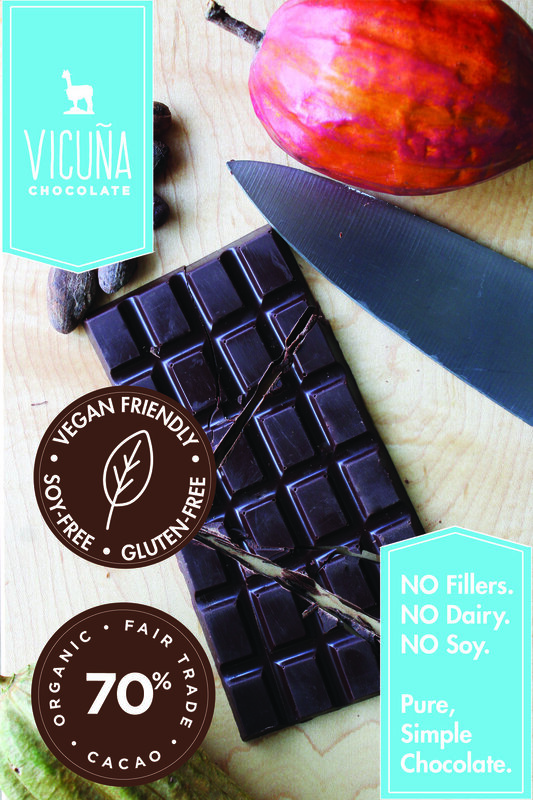 When you experience Vicuña chocolates, you’ll realize the brands you thought you loved were just a flirtation. This is the real thing! We bring a human connection to our chocolate, using only the finest quality natural ingredients and devoting the highest level of attention to detail as raw cacao journeys from bean to bar, all under our roof. Rejoice! A handcrafted treat sure to please.